Former captain Merissa Aguilleira, right, and Anisa Mohammed, both out of the upcoming tour of Ireland and England. T&T's men and women pair­ings of Daneil Williams and Joel Theodore, and Ma­li­ka David­son and LaTeisha Joseph were beat­en in their re­spec­tive round-robin pool open­ing match­es when the 2019 NORCE­CA Beach Vol­ley­ball Tour­na­ment served off in Aguas­calientes, La Is­la de San Mar­cos, Mex­i­co, yes­ter­day. This coun­try's swim­mers will splash off their cam­paign at the 39th Carif­ta Swim­ming Cham­pi­onship with pre­lim­i­nary heats at the Na­tion­al Aquat­ic Cen­tre, Wildey, St Michael, Bar­ba­dos from 9 am to­day. Kavir Boodoosingh shows off his player of the match award after helping T&T to a six-wicket win over the Windward Islands in the Cricket West Indies Under-15 Championship at the Vivian Richards Cricket Stadium in Antigua, on Thursday. ST JOHN’S, An­tigua – T&T put one hand on the Re­gion­al Un­der-15 Su­per50 Cup when it edged Wind­ward Is­lands by six runs in the fourth round of the cham­pi­onship on Thurs­day. Left-hander Darren Bravo drives during a net session at the 3W’s Oval in Bridgetown, Barbados on Wednesday. BRIDGETOWN—Mar­quee bats­man Dar­ren Bra­vo said Wednes­day West In­dies would not be over­awed by their op­po­si­tion at the up­com­ing ICC World Cup in Eng­land but would be fo­cussing on ex­e­cut­ing their unique brand of crick­et. Kavir Boodoosingh shows off his player of the match award after helping T&T to a six-wicket win over the Windward Islands in the Cricket West Indies Under-15 Championship at the Vivian Richards Cricket Stadium in Antigua on Thursday. The fight for the Crick­et West In­dies Re­gion­al Un­der-15 Cham­pi­onship ti­tle will go down to the fi­nal day af­ter T&T beat the Wind­ward Is­lands by six runs yes­ter­day in the penul­ti­mate round at the Vi­vian Richards Crick­et Sta­di­um in An­tigua. T&T medium pacer Djenaba Joseph collects the player of the match award from umpire Carlton Best for her match winning bowling figures of 5 for 6 to help T&T defeat Jamaica by eight wickets in their CWI/TTWCA U-19 Women’s T20 match at Preysal Recreation Grounds, Couva, yesterday. Djen­a­ba Joseph re­turned bowl­ing fig­ures of five wick­ets for six runs from four overs as T&T bowled out Ja­maica for 30 runs in­side 12 overs to se­cure an eight-wick­et win on day two of the Crick­et West In­dies (CWI) T&T Women's Crick­et As­so­ci­a­tion (TTWCA) Un­der-19 Women’s Twen­ty20 Tour­na­ment at Preysal Recre­ation Grounds, Cou­va, yes­ter­day. Nevick De­noon, coach of North­ern Foot­ball As­so­ci­a­tion (NFA) cam­paign­ers Mor­vant El­e­ments, is claim­ing vic­tim­i­sa­tion for the past two years for a stance tak­en against the Re­gion­al As­so­ci­a­tion tour­na­ment. Raymond Tim Kee, former TTFA president, as he seeks to clear the air on allegations made against him, while he also announced his intention to contest the presidential race in November. Ray­mond Tim Kee, a for­mer pres­i­dent of the T&T Foot­ball As­so­ci­a­tion (TTFA), has of­fi­cial­ly an­nounced his in­ten­tion to con­test the post of pres­i­dent at the TTFA elec­tion in No­vem­ber and he said if he wins, all na­tion­al team foot­ball match­es will be re­moved from the Home of Foot­ball in Cou­va, back to the Hase­ly Craw­ford Sta­di­um in Port-of-Spain. Mickel Gormandy receives a trophy from coach Ahkeela Mollon after being named the “Most Valuable Player” of the Under-13 division in the annual Carapichaima Youth football Super League at the Central Regional Indoor Sports Arena in Chaguanas on Saturday. Mick­el Gor­mandy, Is­han Miller and Rayan Francette al­so were cel­e­brat­ed as the “Most Valu­able Play­er” in their re­spec­tive di­vi­sions of the Cara­pichaima Youth Foot­ball Su­per League on Sat­ur­day at the Cen­tral Re­gion­al In­door Sports Are­na in Ch­agua­nas. T&T Under-19 water polo boys team proudly display their gold medals after outplaying Barbados 24-14 in their final at the 2019 Carifta Water Polo Championship which ended at the National Aquatic Centre, Wildey, St Michael, Barbados, on Sunday. T&T Women's U19 cricketer Alysha Gomez receives her Player of the Match award from T&T senior women's player Merissa Aguilleira. Gomez had figures of 4 for 12 in T&T's eight-wicket win against Barbados. T&T batsman, Romario King, who scored a man-of-the-match 107 runs against Jamaica, collects his award. Late former West Indies cricket president, Pat Rousseau. Haitian women’s volleyball champions Les Tigresses will be one of three international teams competing in the third edition of the Glamorgan Volleyball Club Ace It International Invitational Tournament at International School of Port-of-Spain, International Drive, Westmoorings from tomorrow until Monday. Arthur Goberdhan, from left, Steven Mungalsingh, Andre Ali (captain) Radesh Seepersad, Ian Brown, Narinedath Ramlal, Michael Goberdhan and Andy Sirju, members of the Forty Fivers team, who will be looking to take down Headquarters in the National Pool League in Penal tonight. Fatima’s Quinn Clarke, left and Police’s Akim Toussaint battle for the ball in their T&T Hockey Board Men’s Championship Division match at the National Hockey Centre, Orange Grove Road, Tacarigua on Sunday April 14. Police won 3-0. T&T all rounder, Joshua Davis, who scored 51 runs and took 5 for 20 against the Leeward Islands yesterday was named man-of-the-match. Central skipper Aaron Bankay, third from left with star players Ranjeev Droojansingh, at left, front row, Rajeev Ramnath, third from right and Kyle Kissondath, second from right, after defeating North in the final. Kieron Pollard of Mumbai Indians with his son Kaiden after the Indian Premier League match between the Mumbai Indians and the Kings XI Punjab played at the Wankhede Stadium in Mumbai yesterday. Richard Pybus, the current West Indies coach who was appointed under controversial circumstances by the previous Board. Jeremiah Cruickshank, left, and Nicholas Elliot after their half-century opening stand gave their team a good platform to launch for victory. Player of the match Deandra Dottin scored 52 not out and took 2-9 to help Barbados beat the T&T Red Force Divas. CNC3 Morning Brew talk show host Hema Ramkissoon questions T&T Prime Minister Dr. Keith Rowley during an interview on the programme yesterday morning. David John-Williams, president of the T&T Football Association. Sheldon Phillips...former TTFA general secretary. Former Sports Minister Pamela Nicholson, left, receive an award from former T&T World Cup star football player Dwight Yorke during a function on Saturday night held at Shaw Park Complex, Tobago to honour coach Bertille St Clair. National youth players Tariq Mohammed, left, and Liam Mamchan after their demolition job of South West. Under-17 coach Stern John with some members of his staff at a training session recently. T&T players during a recent training session. Trinidad and To­ba­go will face Japan in an in­ter­na­tion­al friend­ly on June 5, the Japan Foot­ball As­so­ci­a­tion an­nounced Fri­day. Ian Brooks and Michael Pereira were both on tar­get as St Mary's Col­lege came-from-be­hind to edge past Tran­quil­li­ty Gov­ern­ment Sec­ondary 2-1 to lift the Over-55 knock­out crown when the ninth In­ter­col Nos­tal­gia Foot­ball Fes­ti­val con­clud­ed at St Mary's Col­lege Ground, Ser­pen­tine Road, St Clair on Sat­ur­day, March 9. NAAATT president Ephraim Serrette receives the Jeffrey Stollmeyer Award (large category) from Sophie White at the First Citizens Sports Foundation's awards ceremony which was hosted on Saturday night at Queen's Hall in St Ann’s, Port-of-Spain. 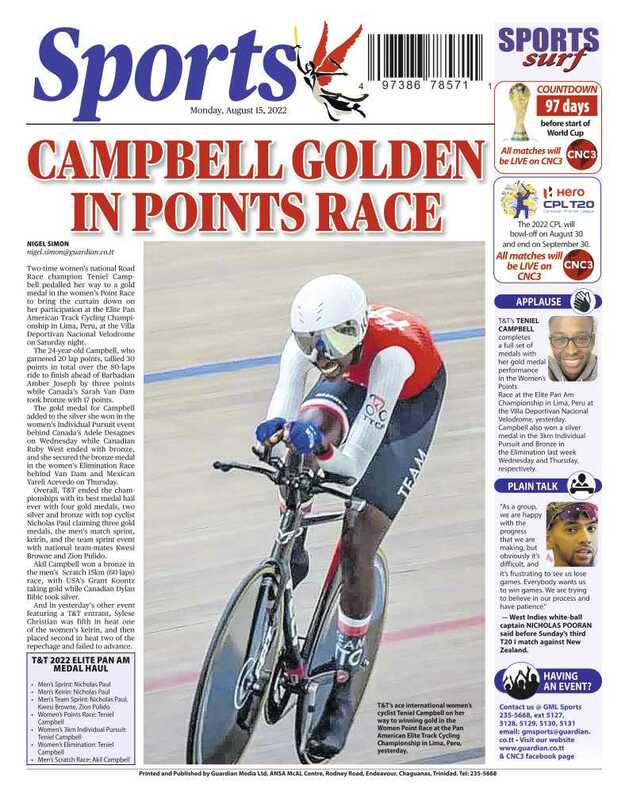 Na­tion­al sprint­ers Jereem "The Dream" Richards and Michelle-Lee Ahye cap­tured the top awards for the sec­ond con­sec­u­tive year when the First Cit­i­zens Sports Foun­da­tion host­ed its 56th an­nu­al Sports Awards cer­e­mo­ny on Sat­ur­day night at the Queen’s Hall, Port-of-Spain to ho­n­our last sea­son's top se­nior and ju­nior na­tion­al ath­letes for their ex­ploits lo­cal, re­gion­al and in­ter­na­tion­al­ly. Kershel Pierre, left, of Signal Hill Secondary School had to the honour of escorting coach Bertille St Clair to the function on Friday at the Signal Hill Secondary School. Leg­endary To­bag­on­ian coach Bertille St Clair was ho­n­oured yes­ter­day in the pres­ence of some of for­mer na­tion­al and oth­er play­ers he coach­es, stu­dent, fam­i­ly and friends when a plaque in his ho­n­our was un­veiled at the Sig­nal Hill Sec­ondary School where coached for more than two decades. FC Ginga’s Ronaldo Rogers collects the “Golden Boot” trophy from Sgt Martin at the Concept Coaching Under-14 Youth Football Tournament "Carnival Edition" awards function for most goals (7) on Saturday at Constantine Park in Macoya, Tunapuna. PROUD CONNECTION Proud owner, Lawrence Berment, left, acknowledges the crowd by lifing his hand in the air as he leads his charge ,Streaking Far together with Hugh Lovelace into Winners enclosure out at Santa Rosa Park, Arima on May 19, after the horse won race 8 going 1750 metres. Entrepreneur Solomon Lee interacts with students during his presentation at during the launch of the Global Coalition for youth employment and school enterprise challenge at Signature Hall Chaguanas, yesterday. That’s Eagle Landing with apprentice jockey Learie C Seecharan Jnr and his charge speeds to the winning pole to win Race 4, the Imported 3 Y.0. & Over Maidens & W.I. Bred 3 Y.0. and Over Horses rated 75-50 going 1,200 metres in Race 4 at Santa Rosa Park, Arima back in 2017. CONGRATULATIONS Paula Gopee Scoon, the Minister of Trade and Industry congratulates the 2018 Derby winning jockey Ricardo Jadoo, who rode Cape Canaveral to the title out at Santa Rosa Park, Arima on Republic Day. Late West Indies fast bowler, Malcolm Marshall. Kamla Maharaj , wife of Kama Maharaj, owner Nuclear Power lifts the NLCB Gold Cup after receiving it from Selby Browne, right, member of the Board of Directors at NLCB. President Arima Race Club, Baskaran Bassawh, is at left. Veteran Sports Journalist Dave Lamy, left, receives Alexander B Chapman award from T&T’s President Paula- Mae Weekes during the TTOC awards ceremony at the Hyatt Regency Hotel, Wrightson Road, Port-of-Spain on Saturday. Merissa Augilleira took home the award of International- Regional Player of the Year when the T&T Women's Cricket Association held its 2018 awards function in Central Trinidad on Sunday night. Driver Ryan Pinheiro, left, and his co-driver, son Scott, were the overall winners at the annual TTRC awards function at Toppers in South Park, San Fernando on the weekend. Thomas Nicholas, left, is presented the “Sportman of the Year” award from Delisa Bilzzard of the Ministry of Sport at the Trinidad Rifle Association end of year function at the Association's Range Facilities on Sunday. Marksman Nicholas - "Sports of The Year"